"My wife just didn't die, she was killed. For me, intentionally or not, that's the bottom line." 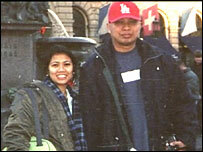 Just hours after Arnel Cabrera's son Zak was born, his wife Mayra died. Instead of being placed on a saline drip, she was given a drug used in epidurals. It was a fatal mistake compounded by the fact the two infusion bags looked almost identical and were both kept in the same unlocked drawers. An inquest ruled her death at Swindon's Great Western Hospital in May 2004 was unlawful. Warnings issued after similar incidents appeared to have gone unheeded. In 2000 a patient at the Royal Liverpool University Hospital died after an identical mistake. The Secretary of the Coroners Society, Andre Rebello, said he reported his concerns about the circumstances of the death to the secretary of state for health. 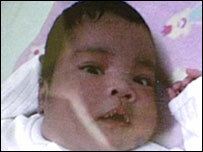 In 1994 and 2001 there were similar incidents in the old Princess Margaret Hospital (PMH) in Swindon. Both patients survived. It highlighted the problem and a policy was introduced to keep the drugs locked up. But when the hospital moved to its new site, the policy was ignored. And in 2001 another patient died in Brighton Hospital prompting an investigation by the Royal College of Anaesthetists and the Department of Health. 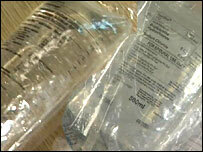 But it was not until April last year that the government finally gave its guidance on storing infusion bags. This was too late for Mayra Cabrera. The government's safety watchdog, the National Patient Safety Agency (NPSA), said it was doing everything it could to make sure no more patients died because epidural infusions were kept in the wrong place. There are 15 million general infusions performed in the NHS every year. The vast majority are delivered safely. However, at least 700 unsafe incidents are reported each year, of which 19% are down to user error. Mrs Cabrera died during childbirth because of an infusion error. She had a severe seizure and heart attack after she was wrongly given an anaesthetic called bupivacaine in her arm instead of a saline drip. Both bags were kept in unlocked cupboards. The fatal mix-up in intravenous (IV) fluid was not helped by the fact that bupivacaine and other IV fluid bags look virtually identical. The most common form of anaesthetic infusion at the time was bupivacaine containing fentanyl which is a controlled drug and has to be kept under lock and key. But the particular infusion bag that led to Mrs Cabera's death was bupivacaine alone, not a controlled drug, and therefore it did not need to be locked away. Powerful drugs are now kept under lock and key and they have to be double checked when they are taken from the drug cupboard. Once in the delivery suite they are checked again by an anaesthetist. It was not until a year after Mrs Cabrera's death in 2005 when Mr Cabrera and then the NPSA first heard there had been a fatal error. Then last April the NPSA told all hospitals to change the way they store bupivacaine and make their labelling clearer. Professor David Cousins, from the NPSA, said: "The idea of having infusion bags that look different and having different storage helps healthcare practitioners get it right. This is relatively new and this is the information we are giving to the NHS now. "More needs to be done in terms of safe systems. We are also working as part of a Department of Health lead research project to develop spinal connectors that won't connect to intravenous. "These new connectors have been used in hospitals over the last few months and we hope to introduce them in due course in the NHS". The Department of Health has not clarified why it took so long to act on warnings from as far back as 2000. In a statement, it said: "The government established the NPSA in 2001 to enhance safer practice. "It identified infusion devices incidents linked to user errors as an early priority for action, investigated the scale of the problem and identified an effective solution. "A safer practice notice on improving infusion device safety was issued in 2004 to trusts in England and Wales. "Early last year, the NPSA issued a national patient safety alert on 'Safer Practice with Epidural Injections and Infusions' to reinforce safer practice in this area." Arnel Cabrera hopes that lessons will finally be learned by his loss, but he still has to tell his son how his mother died. "I am still preparing for the day that my son will ask about mum. I am still preparing for that. I hope that when the time comes I have the perfect answer for that."